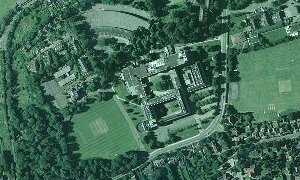 In 2000 Hertfordshire County Council acquired aerial photography for the whole of Hertfordshire and some adjacent areas of interest. The aerial photographs and digital images cover all of Hertfordshire plus certain additional areas including Luton and Stansted Airports and part of North London. For Hertfordshire alone over 1300 9" square prints have been processed using military derived software to create a near seamless image of the County. The photographs are taken from an aircraft using a special on-board camera pointing directly down at the ground. They are kept as digital images and as photographic prints. These vertical aerial photographs are typically used for mapping and survey work; they are taken using high quality film at a low altitude and can be very accurate. They show a great deal of detail, for example buildings, trees and vehicles. Aerial photographs complement maps by showing us a view of the world that we are accustomed to but from a different perspective; the landscape may seem unfamiliar but the images are not difficult to interpret since photographs, unlike maps, do not have a symbology that needs to be understood before we can make sense of them. Each photograph overlaps its neighbours to allow the photographs to be viewed stereoscopically using a special piece of optical equipment known as a stereoscope. This means that the viewer is able to visualise relative heights. Unfortunately aerial photographs do have one important disadvantage when compared to maps; scale distortions cause features to appear in incorrect positions. These distortions result from the aircraft not being able to fly a perfectly straight and level course and from changes in the elevation of the land beneath the aircraft. The aircraft is also buffeted by the wind moving it about in three dimensions (roll, pitch and yaw) so the camera is not always pointed directly downwards. Height distortion is introduced where undulations in the landscape occur causing differing ratios of flying height to the focal length of the camera, thus affecting the scale of the photograph. The worst of these distortions have to be removed or compensated for to allow the photographs to be used in mapping projects. This process is termed orthorectification. Each GeoPerspectives photograph has undergone orthorectification and the distortions are much reduced but can not be completely eliminated. HCC staff can access high quality imagery using ArcView GIS or Webmaps. Schools can use the Hertfordshire Grid for Learning to access the photography. The public can access a reduced resolution version of the photography through HertsDirect WebMaps. The reduced resolution is a legal requirement of the licence from GeoPerspectives. For more information see the full Metadata for Year 2000 Aerial Photography.